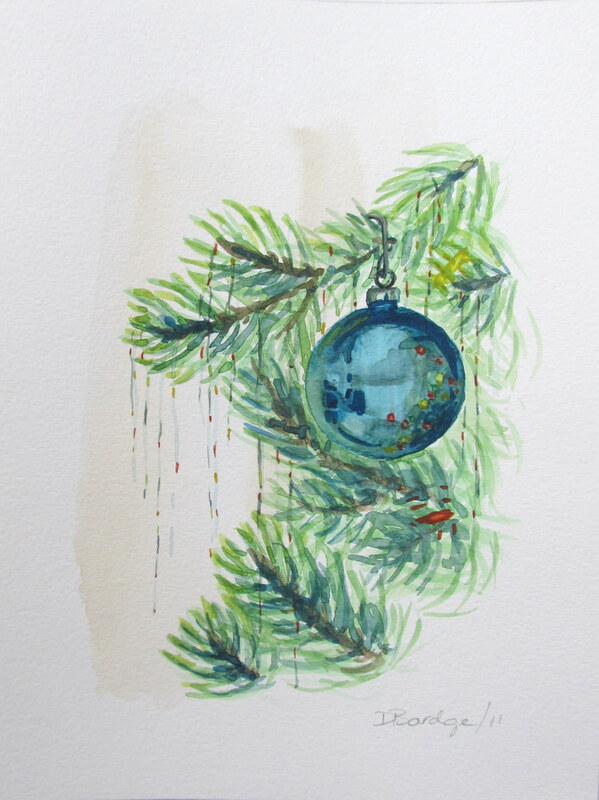 Watercolour Wednesday — Blue Christmas Ornaments, Christmas Tree. I’ve done something else that I said I would never do — a commission! 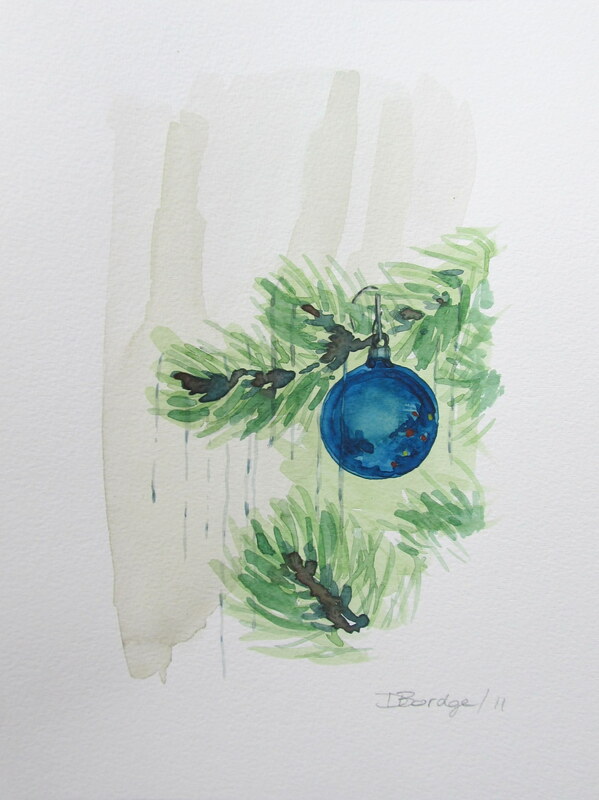 One of my friends asked me to do a painting with a blue Christmas ornament and a tree branch. I stressed and fretted and did three paintings and was not initially happy with any of them until a couple of days later when I decided that I loved all of them…(with the possible exception of the second one I did…which is pictured below right). ← Watercolour Wednesday — Spiced Rum Bottle. This reminds me of being a bridesmaid for your wedding :P I really like the first one but I couldn’t spy a reflection of you in any of the balls! Good on you for doing commission work, looks great! I also love the second – the fullness of the background makes the ball stand out. All the proportions of this one are perfect to my eye. 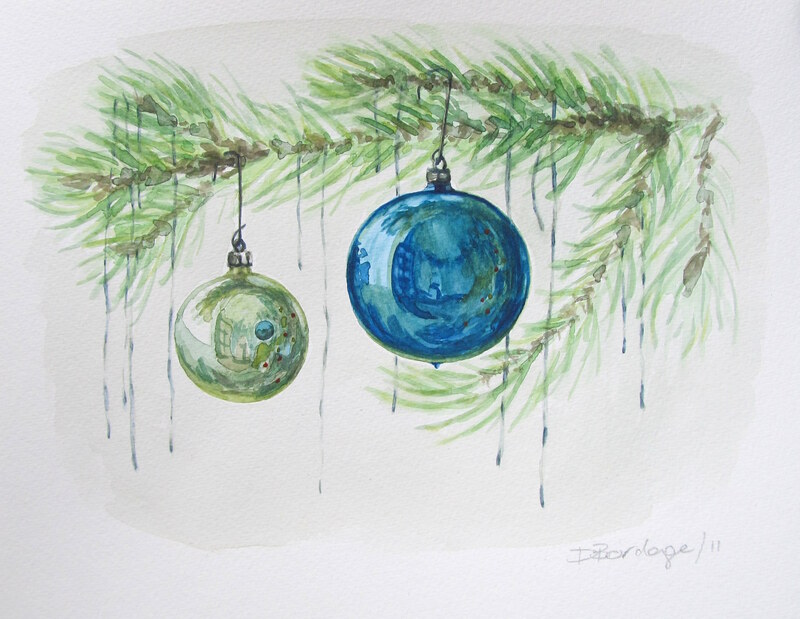 I love your christmas ball and branch, very difficult to paint a ball shape I would imagine. I bought some water colour pecils so I am looking forward to trying them. Have a Merry Christmas Dayna! Thanks Maxine! Merry Christmas to you too! I think they are lovely. The one with two ornament caught my eye along with a flash of childhood memories! Very well done. I love the one with two balls. Reflections are excellent. You inspire me! They’re all stunning! I’ve also been playing with baubles for Cards this year. Great reflections. Those watercolor overnight angels sometime work for me too. Love your work!